1. You barely have any lid space. 2. You'll look like you have a black eye. 3. It's so much work, it's easier not to do it. Believe me, I am probably the only beauty blogger who stays away from smokey eyes, because I just cant get them right! Coupled with the lack of my skills, are my tiny eyes. So I've always done the bright lip and a wash of a light, shimmery eye-shadow all over my eye lid. It works fine, Trust me! Go check any of my FOTDs in the recent past, and that's what I've done. But then I couldn't help wanting a smokey eye look. This is what I'd term a day time, subtle smokey eye look, and it can be intensified to make a night time look, Or another easy smokey eye look, that I'll do another post on. 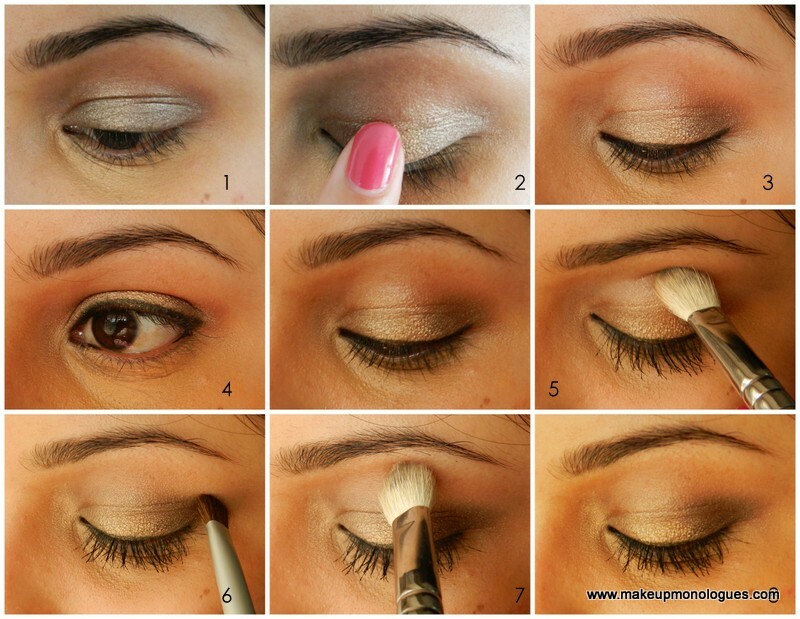 This brilliant way of illustrating the tutorial has been shamelessly copied from Cynthia of Indian Vanity Case. I hope I get half as good as her when it comes to doing makeup! Plus the fact that google keeps wanting me to buy storage space for pictures, helped me make this decision of putting them all together! 1. Apply Maybelline Color Tattoo in Bad to the Bronze (or any shimmery bronze cream eye shadow). 2.In the center of your eyelid, dab some MAC Rubenesque Paintpot (Or any other light gold/ colour from the same family as the base colour). 3. That is how it will look blended. This already gives the subtlest smokey eye. This actually gives an illusion of bright, big eyes. (The same theory when you dab lipgloss in the middle for a pout). 4. Line and tightline your eyes. (I haven't tightlined here. But that gives an illusion of fuller lashes). 5. 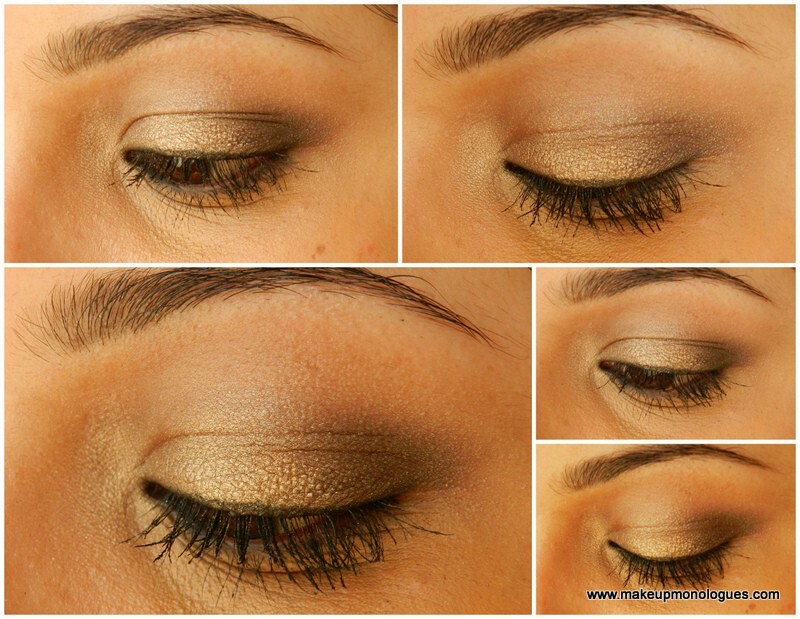 With some loose powder, blend out the edges of the eyeshadow. (Ideally, you should do this before lining your eyes, before the shadow is set, but it dint matter here, sinc the colours are close to my skin-tone). 6. 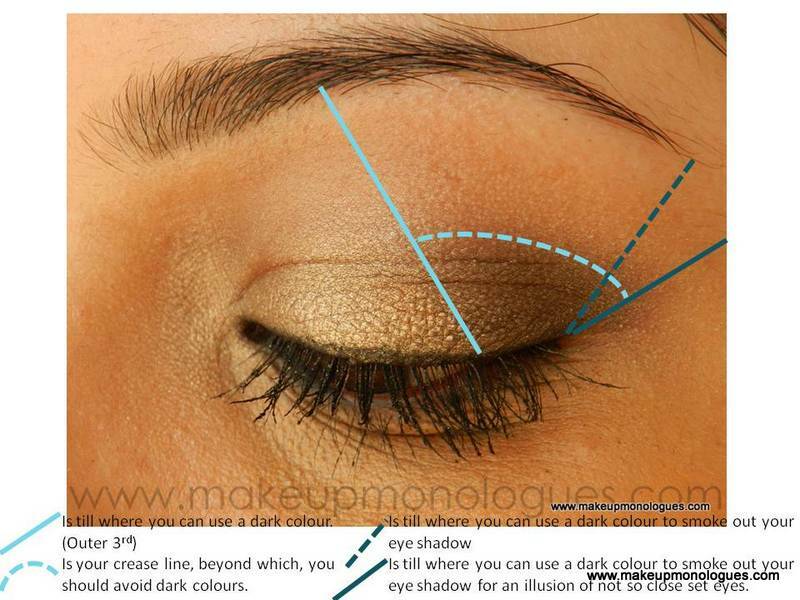 Add a dark brown/ black eyeshadow to the corner of your eye, and blend it in your crease as well. I've used MAC megametal eyeshadow in Unflappable. 7. 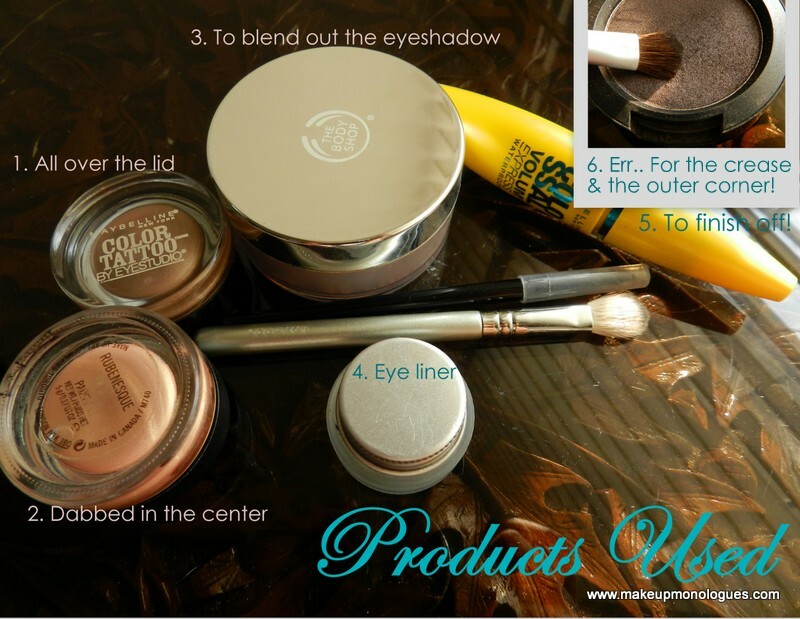 Blend it out with some loose powder, so you have no harsh lines showing. 8. Apply a few coats of mascara. And that's all! Ignore the stray hair. Eyebrow and otherwise. Ignore the crazy explanation/ wannabe technical pictures. Also, please ignore that I've applied mascara in step 5 and asked you to do so on step 8. Tomorrow, I'll post a tutorial on an out an out smokey eye! Editing and re-sizing pictures take time and tutorials are killer! I'll do better next time! I wear a similar look during the day, created with my Sleek Storm palette but never get the edge to look pretty, include that in your next tute/add an Edit if you have the time kay? haha thanks! Where have you beennn? I mailed you! You do? I only wear kajal normally. and liner. :S I din't do anything special. Dint use the scotchtape trick or even wipe out excess. But I'll click a picture tomorrow! Love the pictorial description. Very nicely explained, and love the subtleness. Perfect frosty day look! Thank you so much, Zing! I think this is the first time I'm actually tempted to try out someone's tutorial since you make it sound so easy! I tried something similar recently and oh god, it was a mess (thankfully, no pictures exist). Believe me Arthi, I I can do it, ANYBODY can! Besides, you don't need easy! You're brilliant! So well explained and depicted. :) have very similar shades in my naked palette and do something very similar most of the time! In fact I can't think of using any other shades 90 out of 100 times..feel it goes well with almost all outfits. What a great tutorial! I'm impressed with how much effort you put in your posts.